IT WAS a curious experience to move about looking at rows of artworks. Decidedly more captivating than a postmodern shopping centre or the infusion of lights and sounds at a casino, this dedication to art at the Cape Town International Convention Centre (CTICC) is a delight for the eye and, indeed, the mind. This second staging at the CTICC means the fair was the largest of previous shows and it is hoped this will remain the venue until at least next year. It is evidently a huge success, leading to a number of sales and the awareness that art from South Africa and Africa, in general, is one of great variety and quality. While it would not be possible to mention exactly who exhibited the 80 galleries involved (which included most of the reputable Cape Town galleries as well as other galleries around the country, Africa in general and a selection of international galleries too), it was captivating to meander up and down and in between booths, the eye settling to articulate form into or as meaningful content. There was, for example, one series of works by world famous Venezuelan artist, Carlos Cruz-Diez which I was to discover is pigment chromatography on aluminium (there were also silk-screens engineered with the same, odd effects) that created a wonderful haze effect, the light distribution such that at different angles and distances one was to see images in transformation, little optical effects that were surprising and seemingly inexplicable. The colours, almost scientifically worked out to render this changing perception, produced at once a fog of sorts and then a series of interactions that produced geometrically pleasing structures. The artist also has a spiritual intention. Could it be that changing hues and the rigour of hard-edged abstraction teaches one that beauty is something created through harmonious interaction, that it takes time to mature and deepen and that – finally – it is not something static but requires a subtle glow and evolution, a process that is incomplete until consciousness registers its existence? In this respect, nature (body) may become culture (mind) and then we are able to extract from nature once more through sensitivity in – as but one example – cultural pursuits. His work reminded me of Yaakov Agam’s and draws from artists such as Suerat (and Pointillism) and possibly Cezanne. The Venezuelan South is as relevant as is the African South. Swiss artist Hennric Jokeit, represented by Erdmann Contemporary, was also a highlight as his photographs – at once scientific and aesthetic – created a sort of calming effect, a concentration of light and dark and an inversion of the African mask. Then there was a throng of images that “jumped” off from the wall, which were sometimes recognisable and sometimes not. A mere tip of the iceberg. The whole fascination with an art fair in contradistinction to a single gallery space is that rather than a competitive struggle between the said galleries, there is instead a celebration of the arts of South Africa and beyond in itself, each gallery offering another piece of the puzzle, another intellectual and aesthetic story. This is a show that transcends any focus, while it is decidedly African and needs the investment in infrastructure for the exhibition walls and lighting. The expansion of art networks meant that groups of international collectors, important players within the art world, were brought together for the Fair, and although it is not as old and international as Art Basel, for example, the Cape Town Art Fair is one of the “unmissable” art events of the year as far as contemporary art is concerned. And this is only the beginning of what will be further growth in the industry. Indeed, there is more space for other galleries and a role to play by curators and collectors to talk and so create, sustain and further develop cultural pursuits on possibly a global scale. The Cape Town Art Fair is one way to bolster the presence of art. Yet one must be cautious here, for one runs the risk of turning art into more consumer culture and mere economic leverage. Art, in order to survive, needs to be critical not simply complicit with the culture it is said to represent or frame. All in all, a most enjoyable experience, but while the eye was saturated there is much pause for one to reflect . Now that art has a voice here on the tip of the African continent, how can art be most effective in its symbolic and material value, a call to prophesy or without such an outdated utopian vision, as “objects” that embody real human questions, feeling, intuitions and instinct? In the frenzy I probably missed as much as I gained, and there are probably scores of good art not even within the walls of the CTICC space. One can only look forward as the momentum created by this festival has surely been attained. 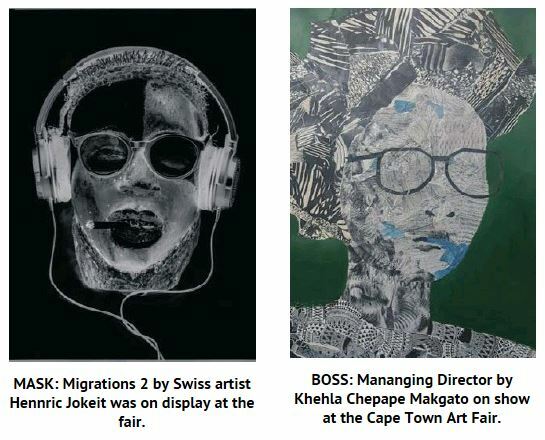 Congratulations to all those involved and recognition to Tumelo Mosaka, the newly appointed Cape Town Art Fair curator and Laura Vincenti, now chief operating officer, who have been leveraging their mutual expertise and international networks to place the Fair on the global art calendar.